There have been some compelling new studies on global inequality and the impact of growing income gaps in the US and Europe. From these studies we can draw some conclusions about the causes of the rise of so-called ‘populism’ – the mainstream jargon for those elements in society that no longer accept the neoliberal model of globalised free market capitalist development of the last 40 years. The Global Wealth Migration Review covers global wealth and wealth migration trends over the past 10 years, with projections for the next 10 years. Total private wealth held worldwide amounts to approximately US$215 trillion. The average individual has net assets of US$28,400 (wealth per capita). But there are approximately 15.2 million ‘high net worth individuals (HNWIs) in the world, each with net assets of US$1 million or more. And there are approximately 584,000 multi-millionaires in the world, each with net assets of US$10 million or more. Finally, as we go up the wealth inequality spectrum, there are now 2,252 billionaires in the world, each with net assets of US$1 billion or more. Global wealth has risen by 27% over the past 10 years (from US$169 trillion at the end of 2007 to US$215 trillion at the end of 2017), assisted by strong wealth growth in Asia. Global wealth is expected to rise by 50% over the next decade, reaching US$321 trillion by 2027. This will again be driven by strong growth in Asia. The fastest growing wealth markets are expected to be Sri Lanka, India, Vietnam and China. The report measured the proportion of wealth controlled by millionaires (HNWIs) – the higher the proportion the more unequal the country is. The most equal countries in the world (based on % of country’s wealth held by HNWIs) were Japan (23%), New Zealand (26%), Norway (27%), Australia (28%), Canada (28%), Germany (28%), Sweden (28%), Denmark (29%), South Korea (29%) and Finland (29%). But remember this means the ‘most equal’ Japan still has HNWI owning 23% of all personal wealth – pretty unequal! Japan has (only!) 35 billionaires which is well below the likes of USA, China, India, Russia and UK. The most unequal countries in the world are Saudi Arabia (60%), Russia (58%), Nigeria (56%), Brazil (53%), Turkey (52%) – and these are probably the most corrupt (relative to any ‘rule of law’). The inequality wealth ratio is 36% for the US and the UK, 40% for China and 48% for India against a worldwide average of 35%. Yes, HNWIs own on average 35% of all the world’s personal wealth in property, financial assets and cash. Another interesting measure is the proportion of a country’s wealth held by billionaires. ‘Croney capitalist’ Russia tops this list with 24% of total Russian wealth held by its oligarch billionaires. Japan again is the most equal with billionaires only controlling 3% of total wealth there. Against this report on global inequality of wealth, there is inequality of income within countries. I have reported on this in many posts but it is really something when the United Nations issues a report on poverty that singles out the US under Donald Trump in deliberately forcing millions of Americans into financial ruin, cruelly depriving them of food and other basic protections while lavishing vast riches on the super-wealthy. At the same time as the UN published its damning analysis, the US Federal Reserve annual economic survey was released. It found that there was large pool of Americans who are vulnerable to any further erosion of their incomes. It found that four out of 10 Americans are so hard up they could not cover an emergency expense of $400 without borrowing money or selling possessions. Over one-fifth of American adults are not able to pay all of their current month’s bills in full. Over one-fourth of adults skipped necessary medical care in 2017 due to being unable to afford the cost. Over half of college attendees under age 30 took on some debt to pay for their education. Nearly one-fourth of borrowers who went to ‘for profit’ universities are behind on their loan payments, versus less than one-tenth of borrowers who went to public or private not-for-profit institutions. Less than two-fifths of non-retired adults think that their retirement savings are on track, and one-fourth have no retirement savings or pension whatsoever. He reckoned that, given the size of the income gap, migration pressure will continue unabated or greater for at least 50 or more years —even if Africa in this century begins to catch up with Europe (that is, to grow at rates higher than those of the European Union). Nor is that pressure, in terms of the number of people who are banging on Europe’s doors, static. Since Africa is the continent with the highest expected population growth rates, the numbers of potential migrates will rise several-fold. While the population ratio between today’s sub-Saharan Africa and the EU is 1 billion vs. 500 million, in some thirty years, it will be 2.2 billion vs. 500 million. Other than migration, the second issue fuelling the European political malaise is rising income and wealth inequalities. 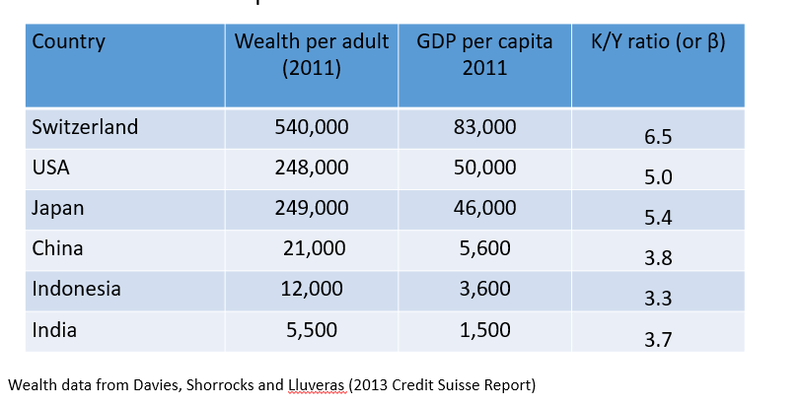 Switzerland is not only richer than India in terms of annual production of goods and services (the ratio between the two countries’ GDP per capita at market exchange rates is about 50 to 1), but Switzerland is even more richer in terms of wealth per adult (the ratio is almost 100 to 1). Take Italy. The Italians ‘populist’ parties have taken over the government with a program of restricting immigration and reducing inequalities – the Lega wants to kick out all ‘illegal’ immigrants while Five Star wants to introduce a universal basic income to help those struggling to find jobs or are in ‘precarious’ occupations, particularly in southern Italy. The damage that done by the last 40 years of so-called neoliberal reforms designed to raise the profitability of capital at the expense of labour is revealed in another report on weekly working hours and earnings since the Great Recession. One of the main ‘reforms’ made since the Great Recession under the centre-left Democrat government in Italy was the Jobs Act. Most Southern European mainstream governments introduced labour market reforms with the aim to increase ‘flexibility and competitiveness’, in line with EU requirements. In Italy, the `Jobs Act’ introduced a new labour contract with no protection from firing in the early years of seniority and has made several changes favouring firms over workers. A recent report found that there was “no evidence of the expected boost in employment.” Instead, “an increase in the share of temporary contracts over the open-ended ones is observed; a raise of part-time contracts within the new permanent positions emerges. The ‘Jobs Act’ appears to be ineffective in terms of quantity, quality and duration of the jobs created since its introduction.” No wonder the first proclaimed task of the new populist government in Italy (after kicking out immigrants) is to repeal the Jobs Act. For capital, the price of globalisation, rising inequality and the Long Depression, accompanied by so-called ‘neoliberal reforms’, is the ‘populist’ threat to the existing order of the so-called ‘centre’ of the political spectrum. But populism too will fail to end the trend of rising inequality, stagnation and the global displacement of millions. This entry was posted on June 5, 2018 at 10:24 am and is filed under capitalism, economics. You can follow any responses to this entry through the RSS 2.0 feed. You can leave a response, or trackback from your own site. I just want to call your attention to some very interesting research done by the UNCTAD Division on Globalisation and Development Strategies about corporate rent seeking as a major driver of income inequality. I think it would be a good topic for your blog.